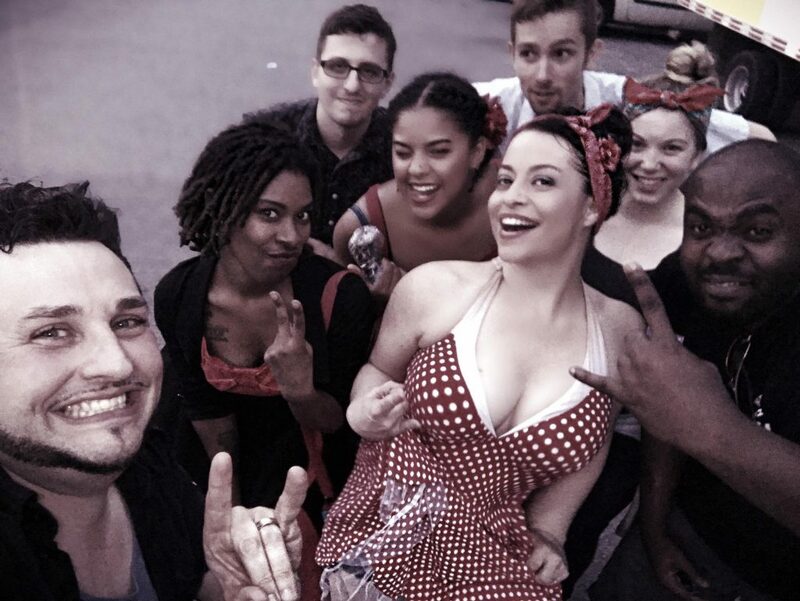 SPITFIRE ROOTS ROCK & SOUL! AT THE 2018 JOSIE MUSIC AWARDS! 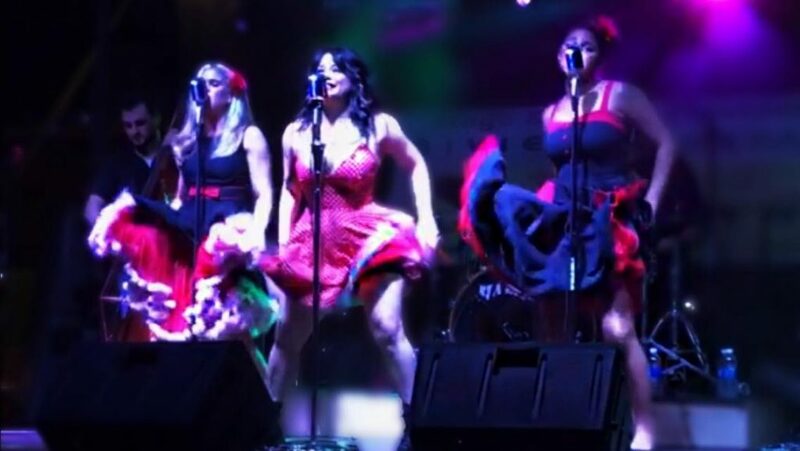 Saturday, Sept 8th 2018, Rio and the Rockabilly Revival traveled down to the Celebrity Theater at Dollywood in Pigeon Forge, Tennessee, to be the opening act at the 2018 Josie Music Awards!! The Josie Music Awards are the biggest independent awards show anywhere that we know of! Artist came from as far away as Malaysia and Australia, let alone every corner of the Americas. 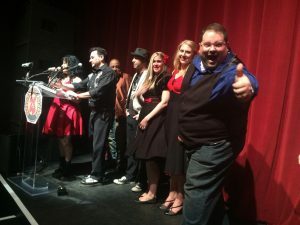 And not only did we go and give the wonderful artists and fans a full Revival experience in the 3 minutes it took to perform “Runaway Train,” we also won the award for Americana Entertainer of the Year! We were so honored to just be nominated and invited to perform. We had no idea we would win. So much so, no one prepared a speech! Videos from our performance and when they announced our award will be posted soon! Thanks to all the Revival fans, and thanks to the Josie Music Awards judges, and all the independent musicians out here in the trenches everyday! 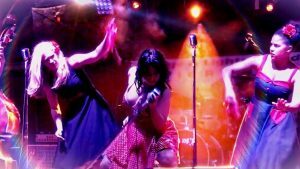 The Revival has been invited by the MetroTimes to be one of the featured acts on a triple headlining bill at the Roostertail in Detroit, along with other Detroit sensations The Reefemen and The Beggars. 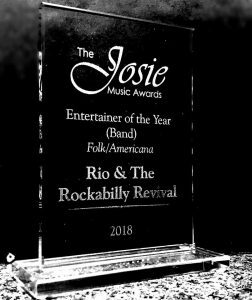 RIO AND THE ROCKABILLY REVIVAL and RIO SCAFONE nominated for 2018 JOSIE MUSIC AWARDS!!! That’s right! 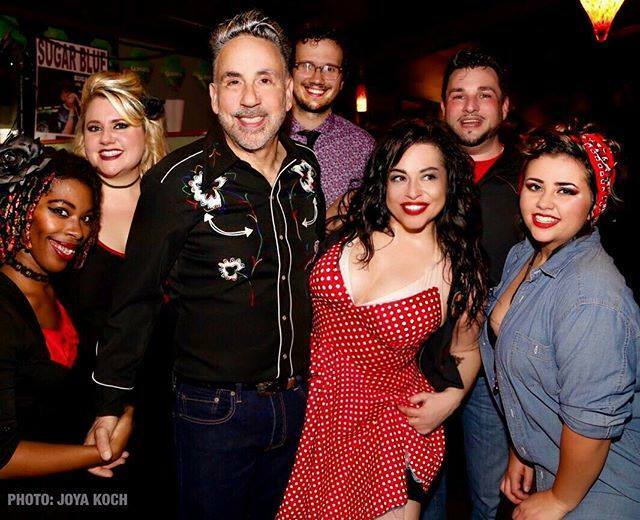 Rio and the Rockabilly Revival have been nominated as Americana Artist of the Year for the 2018 Josie Music Awards, and Rio Scafone has been nominated as Vocalist of the Year (across all genres and genders). WOW! Such a huge honor! This year’s Josie Music Awards Ceremony will be held on September 8th, 2018, at the Celebrity Theater inside DOLLYWOOD, in Pigeon Forge, Tennessee. Rio and the whole gang will be in attendance in our full regalia, as well as many fans and friends who have said they want to be there to celebrate independent music, explore Dollywood, and support the Revival! We are so excited to be nominated with all the amazing musicians and music makers included in this year’s “Josies” Nominees!! Thank you as always for your support! NEW REVIVAL STUDIO ALBUM COMING! 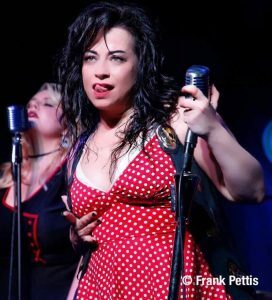 Rio and the Rockabilly Revival have started the first phases of our third full studio album, expected for release in late spring of 2019! With recent additions in our line up, we are excited to announce plans for a late Spring album release. 2018 Detroit Music Awards are a-Coming! 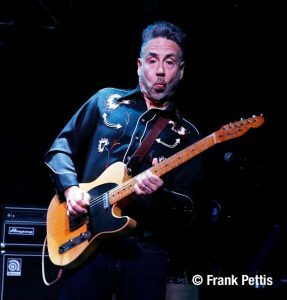 Rio and the Rockabilly Revival had a GREAT 2017! We thank all of YOU for helping make it that way! Wow! That’s quite a list!! Thank you so much to our peers in Detroit and beyond for all your support, and a special thanks to our fans around the world! And in case you missed the shows, here’s a few quick moments from 2017. Cheers!!! The spirit was all up on Rio at Otus Supply!! Lawd have mercy!! 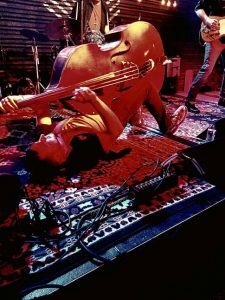 The good people of Port Huron did not know what hit them when Rio and the Rockabilly Revival headlined at Art On The River, June 2017. L-R: Junebug, Lish, Rio & Charissa. Don’t miss this special holiday treat: The Jive Aces and Rio and the Rockabilly Revival perform together for a special FREE LIVE STREAM CONCERT! That’s right! You can watch it in your underwear from wherever you live, if that’s the kind of thing you’re in to! So tune in and enjoy some great holiday swingin’, jivin’ good times! Yes, yes and YES! 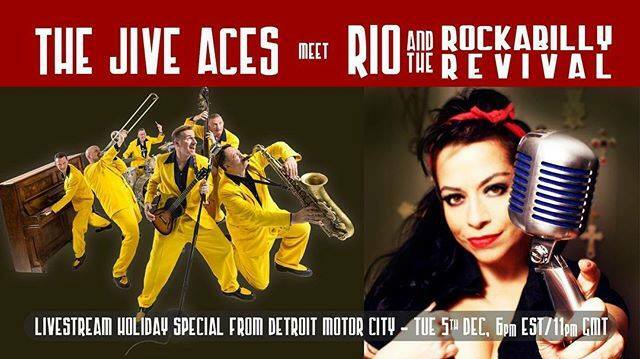 Rio and the Rockabilly Revival will be playing our hometown of Detroit, MI for a special festival that was apparently created out of our dreams! It’s the 2017 Garlic & Music Festival!!! 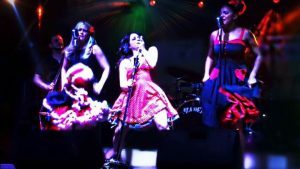 Rio and the Rockabilly Revival headline the Art On The River Festival 2017!! 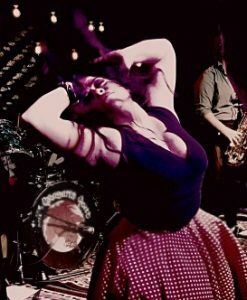 September 4th is the birthday our of fierce, fearless front woman, Rio Scafone. So to celebrate, FREE MUSIC for our fans!! Click the link to receive a smattering of 5 of our most popular tracks! Thanks for being the best fans in the world! WE HAVE EXTENDED THIS OFFER THROUGH SEPT 17th! ENJOY FREE MUSIC! FREE MUSIC LINK – HAPPY BIRTHDAY, RIO!! 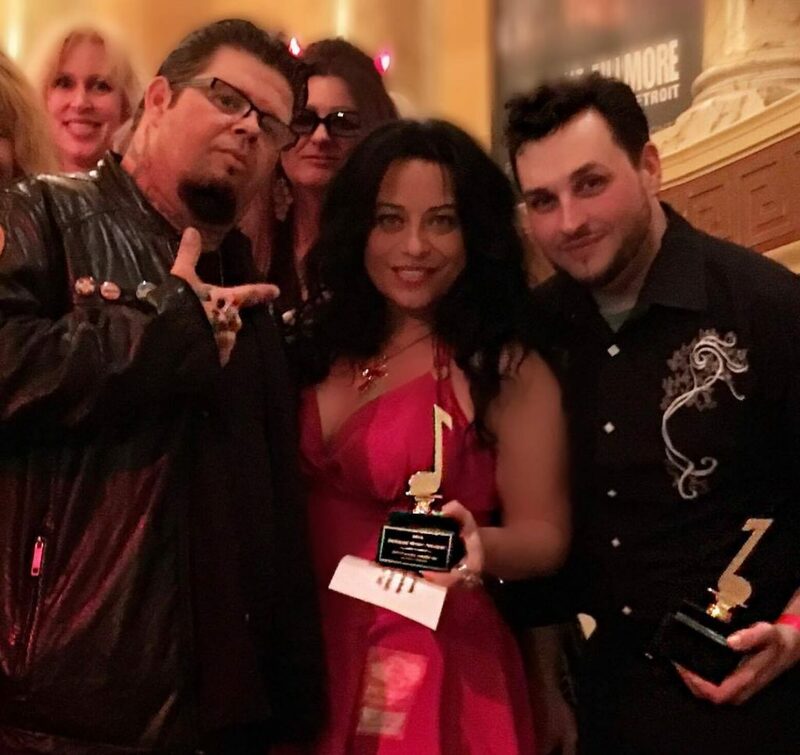 Rio and the Rockabilly Revival took top awards in two categories for the 2016 Detroit Music Awards, taking both Outstanding Americana Artist/Group, as well as Outstanding Americana Recording: “Testify.” Absolutely amazing! With Detroit’s rich musical history and community of world class artists, it’s an honor to be recognized in this way. We also received nominations for Outstanding Live Performance (across all genres) and Outstanding Independent Video (under $10,000 budget) for “Santa Skipped My House,” as well as Outstanding Americana Vocalist; Rio Scafone, Outstanding Americana Instrumentalist: Junebug Harris; and Outstanding Americana Songwriter: Rio Scafone. We want to thank everyone associated with Detroit Music Award Foundation as well as all the industry professionals that voted for us, support us, and deemed our music to be among the best of what Detroit has to offer! We look forward to bringing more Revival to the DMAs, Detroit, and to our fans around the world! 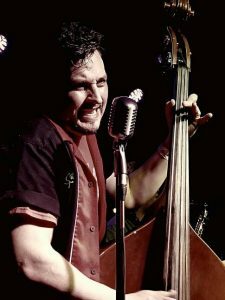 Just announced: Rio and the Rockabilly Revival will be performing at the 2016 Detroit Autorama on Saturday, February 27th, at 1pm. 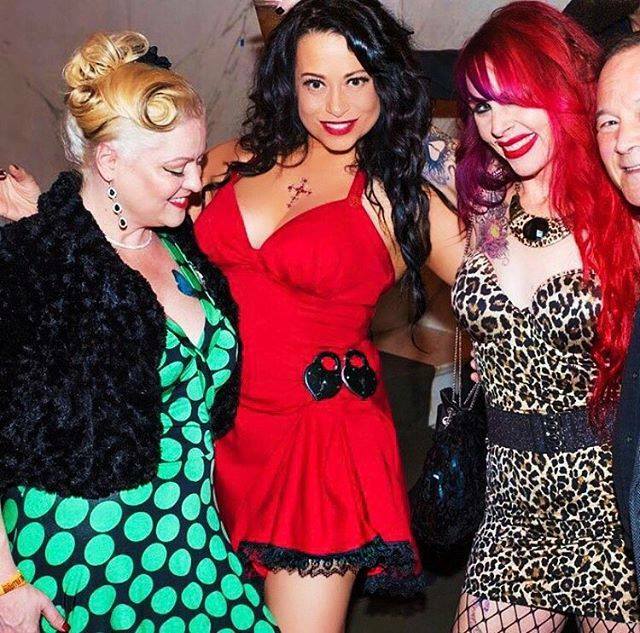 We will also be welcoming 89X’s Cal Cagno up to help us kick off the annual Pinup Girl Contest! Looking forward to seeing you all there. Get tickets at autorama.com/attend/detroit. Follow Cal on Twitter @calandco or on Facebook.com/CalCagnoListeners. 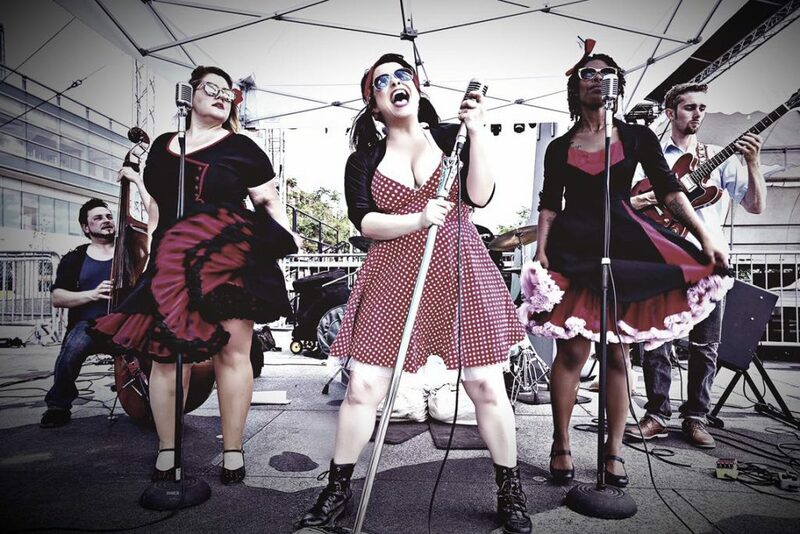 RIO AND THE ROCKABILLY REVIVAL at the Ford Arts Beats & Eats (sponsored by Soaring Eagle Casino) will be performing on the Americana Budweiser stage on Sunday, Sept 6th at 8:00 PM EST. Leading up to the show will be several on-air events, include a performance on the Mitch Albom show on WJR Radio Detroit on Tuesday, Aug 16 2015, 5pm-7pm Eastern Time. 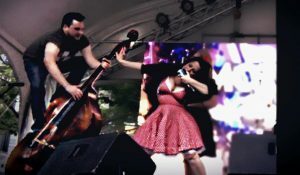 RIO AND THE ROCKABILLY REVIVAL heading to Europe for series of shows in Ireland and the UK. First show kicks off with headlining slot at the Rock & Jock in Dublin, Ireland, on July 4th. 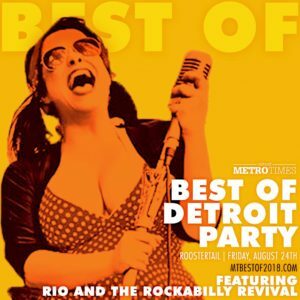 RIO AND THE ROCKABILLY REVIVAL voted Best Original Band in HOUR DETROIT MAGAZINE for the coveted title in Hour Detroit’s Annual “Best Of” edition! This is the second year in a row The Revival has been recognized by the magazine’s readers’ poll as Best Of Detroit! 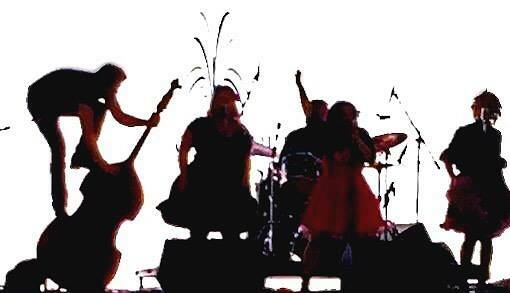 RIO AND THE ROCKABILLY REVIVAL win 2015 Detroit Music Award for Outstanding Americana Artist/Band! Also receive nominations for Outstanding Americana Vocalist (Rio Scafone) and Outstanding Live Performance (across all genres).